Tenna is a cloud-based IoT solutions company offering a premium asset management platform that monitors all asset classes on one easy-to-use software system. 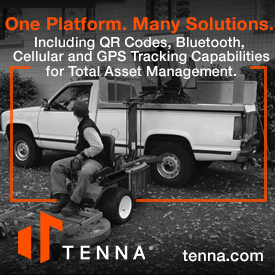 With associated hardware devices allowing clients to track all varieties of assets from fleet and heavy equipment down to small tools and materials, Tenna offers a multitude of unique solutions helping landscaping businesses manage and capitalize on their assets and increase operational efficiencies. Tenna’s product is unique in that it offers a comprehensive set of asset management solutions for any type of asset on a single cloud-based platform, which is cost effective and maximizes ROI.